Osinbajo who spoke at a post-2019 election thanksgiving held at the Obafemi Awolowo Square, Ikenne-Remo, Ogun State. He was joined by his wife, Dolapo, the governors of Lagos and Oyo States, former Osun State Governor Ogbeni Rauf Aregbesola, Ogun State Governor-elect Dapo Abiodun, Senator Godswill Akpabio, former Minister of State for Defence Musiliu Obanikoro, traditional rulers, among other dignitaries. Osinbajo said apart from surviving the plane crash alongside 11 others, it was the mercy of God that saw him through the rigours of the electioneering. Earlier, Osinbajo’s wife recalled that she was in Ikenne when she received a call about the helicopter crash. 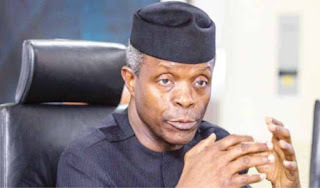 Abiodun described Osinbajo as an embodiment of diligence and sincerity. In his sermon, the Archbishop of Ecclesiastical Province of Lagos, Reverend Olusina Fape, attributed the victory of the All Progressives Congress (APC) at the just concluded presidential election to God’s mercy.